Meet Jeanne D. “On July 6th, 2015 I was at work when someone accidentally hit me with a wooden pole. This one accident shifted my whole life. For the next weeks after the accident, I slept 20 hours a day. Sensitive to light, the summer sunshine was unbearable. My sound sensitivity left me feeling like I was in a prison of sound. 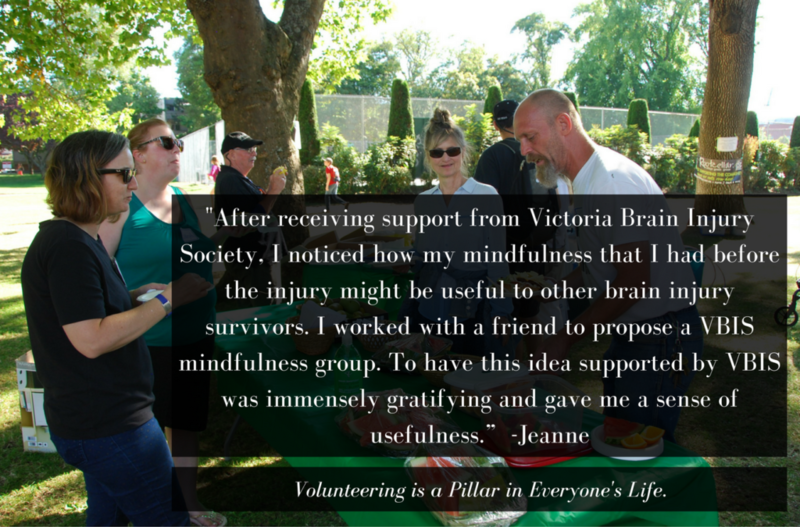 After receiving support from Victoria Brain Injury Society, I noticed how my mindfulness skills that I had before the injury might be useful to other brain injury survivors. I worked with a friend to propose a VBIS mindfulness group. To have this idea supported by VBIS was immensely gratifying and gave me a sense of usefulness. In the quicksand of my life, VBIS gave me a solid ground to step on and grow from. I volunteer each week to facilitate the group, preparing the topic for the group and working with other volunteers to ensure everyone feels comfortable and at ease. We have an average of 8 participants per week, over 40 people have attended mindfulness practice. We’re encouraging participants to lead parts of the group so even more survivors can benefit from volunteering. People are beginning to think ‘maybe I can do this too’. We have helped inspire two more volunteers to regularly lead the group.